There are few things more anxiety-inducing than seeing a cop car's flashing lights in your rearview mirror. 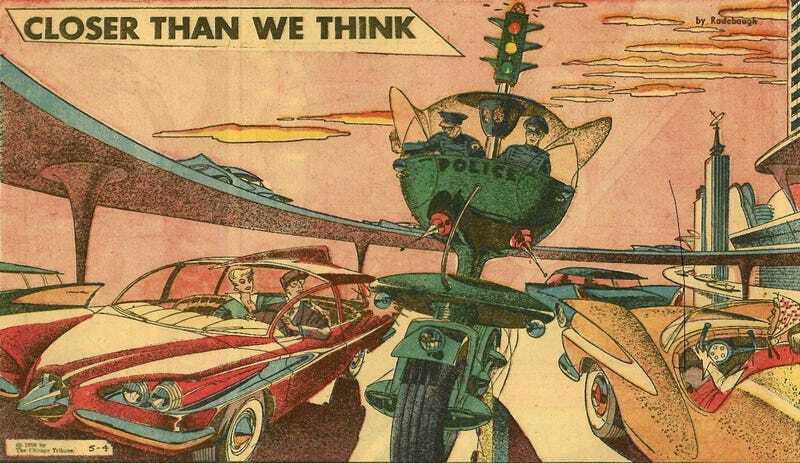 But that terror probably would've been about a thousand times worse had this police car of the future from 1958 ever become a reality. Detroit-based illustrator Arthur Radebaugh designed countless cars for clients in the 1950s, but he took those talents to new futuristic heights for his comic strip, "Closer Than We Think." The strip ran in newspapers throughout the U.S. and Canada from 1958 until 1963 and included plenty of opportunities for Radebaugh to show off his streamlined automotive skills — like in the "Pogo" police car pictured above, which provides cops a lot more ease in zipping through traffic. Not to mention a pretty terrifying presence over the rest of us. Beat-walking policemen gave way years ago to modern, speedy squad cars. But today squad car movement is slowed down by the increasing crush of traffic. The solution could be a radical new kind of transportation designed for mobility on jammed streets. Here, for tomorrow, is the concept of policemen on mechanical pogo platforms — giant, tandem, wheeled vehicles kept upright by gyroscopic action, high enough to see across expressway tieups, narrow enough to wheel through them to any point of trouble. Today, police cars aren't quite as intimidating as the ones they were imagining in 1958. But much like the jetpacks and flying cars Radebaugh imagined in his strip, they could still be just around the corner.